Was perusing a discount book store and came across Top Ten Book 1 trade paperback from America’s Best Comics, a DC imprint. It collects the first seven issues of the series and includes character designs as bonus material, 208 pages in total. The first issue is available as a PDF preview. This is the tale of Neopolis, a modern metropolis with a citizenry made up exclusively of super beings. In a city where everyone is blessed with powers, it takes a unique and powerful police force to protect and serve. 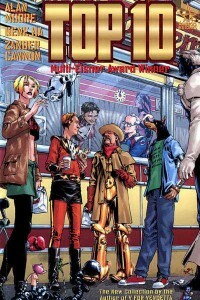 In this Eisner Award-winning book, we are introduced to the extremely diverse officers of Precinct Ten; an armored and talking dog, a genetically engineered “perfect woman,” a high tech cowboy, an indestructible man, and a rookie with a toy box full of “helpers.” Individually they are unique personalities, together they are Neopolis’ finest. Let me sum it up for you: cop drama with super powers. This could easily be the next police drama on television as it follows the basics established by Hill Street Blues: show the police as real people and develop the characters. That’s not a criticism: I like police dramas and I liked Top Ten. Characters are nicely developed as the story unfolds through the eyes of a rookie cop; you’re immersed in the story and it’s environment. Since it’s a comic book and people have super powers or abilities there is a nice twist on the heroes and villains. Art and specifically credits for the book are very odd. 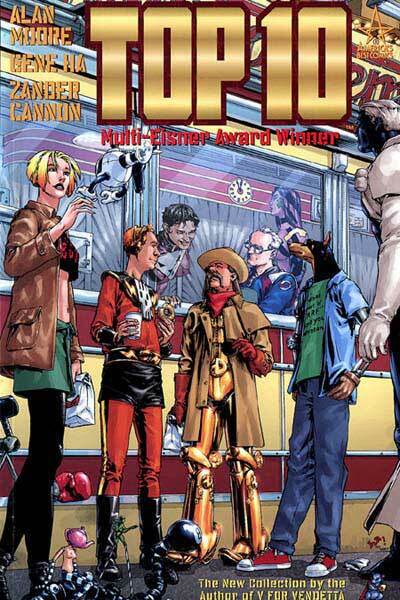 Gene Ha is listed as finishing artist and gets top bill while Zander Cannon is listed as layout artist. Based on credits in the individual issues collected it looks like Ha did the pencils and inks and Cannon really did just do layouts. As I said I’m not a fan of Gene Ha’s style but after reading Top Ten Book 1 I was comfortable with it and was immersed in the story. It’s well presented and I highly recommend it.